door traceries in that style, and those of the style we are now considering; but, at the same time, I have explained that, in most cases, the former are more angular in feeling and detail than the latter. A comparison of those illustrated in this book, as representative of the respective styles, will make this difference perfectly clear. It may be well to draw attention, also, to the fact that Sheraton favoured the oval greatly as a centre-piece, and was fond of introducing the vase and the "Prince of Wales's Feathers," with other detail, in connection with it. Another most important feature by which " Sheraton" may be distinguished from " Heppelwhite," and which gives the originator of the former the greater claim to superiority, is the pediment, when it is present, in the larger and more pretentious cabinet work. We have studied Heppelwhite's ideas concerning the forms which this should take, and have come, I think, to the conclusion that, in that respect at least, he has been found sadly wanting. It is not necessary for me to recapitulate what I have already written upon that point; but I may remind my readers that the " Heppelwhite" pediment is almost invariably " finikin" and fragile in appearance as well as in fact, and quite unworthy to occupy a place on most of the structures which it surmounts. 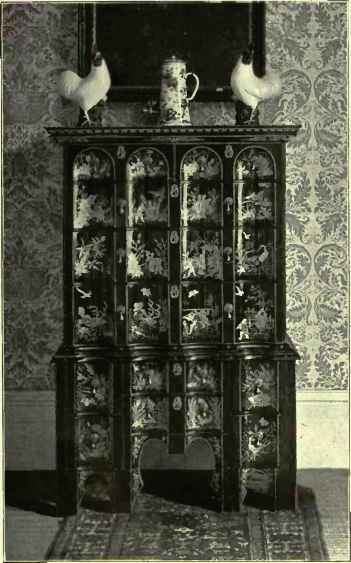 We have remarked that the design, in nine cases out of ten, was far more suitable for being rendered in painting, or marquetry, than in pierced carving — the medium usually adopted.